For this ‘Next Step Sea Kayaking Skills’ course you should have the ability to swim with a buoyancy aid on. 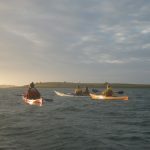 On this Next Step Sea Kayaking Skills course the day will be spent journeying through the islands on Strangford Lough or on one of our local coastal venues depending on the weather. You will be coached through a range of basic skills such as moving forward efficiently and turning the boat effectively, learning to tailor your paddling/strokes to the environmental conditions, discuss the range of equipment available, what is essential to take and what is desirable, etc. At the end of the session there will be discussions around weather, tide, maps and planning your own journeys. This Next Step Sea Kayaking Skills course is aimed at those who already have some sea kayaking experience. 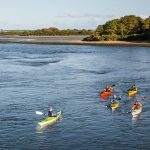 It is ideal for those who have attended a ‘First Step Sea Kayaking course or have attended our ‘Guided Sea Kayaking Evening‘ series. Welcome, introduction to trip planning, boat & equipment selection. Students will be able to avail of all kit and equipment from our extensive stores. Participants will be required to bring footwear suitable for paddling (old trainers), warm long sleeved top, towel/toiletries, swimwear, etc. The Next Step Sea Kayaking Skills course fee includes kit and equipment, in-course transport, instruction from one of our qualified instructors, packed lunch, tea/coffee and a famous chocolate brownie or flapjack. You may also wish to bring your own personal snack food for use during the course. You can fill a flask with tea or coffee at the Centre if required.